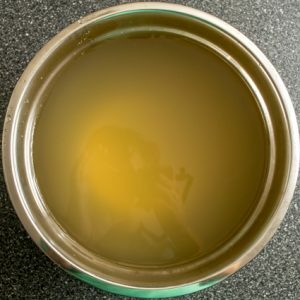 After giving some recent, heavily biased evidence that a simple veggie stock can save the world, I wanted to offer up another stock option that has the potential to instantly upgrade any kitchen. 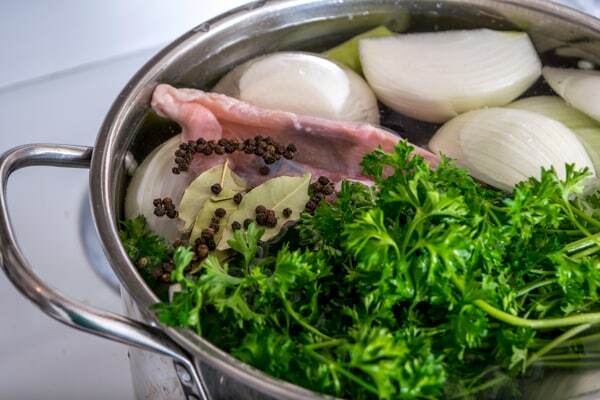 This chicken stock will be offended if you treat it as a recipe. Recipe lists make people run out and grab final ingredients from the grocery store. 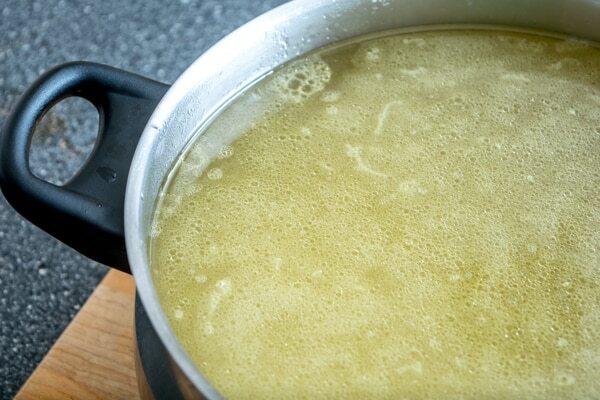 This chicken stock won’t have any of that last minute scrambling. 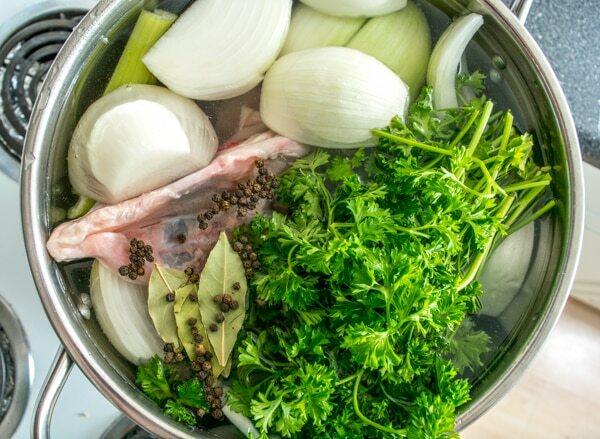 The simple act of making stock produces 90 percent of its goodness. The other 10 percent comes from following some very forgiving guidelines. So don’t worry about having bay leaves for your next batch …just Use What You Have. My freezer has four chicken carcasses all mashed up in a big clump of frozenness. Perfect! This clump will go in a 2 gallon pot and make about 1.5 gallons of heavenly stock. These are carcasses with the legs, thighs, and breasts removed. Each weighs close to one pound, so we’ll have 4 lbs. of carcass and start with approximately 2 gallons of water. This pot could easily hold 8 carcasses (8 lbs.) or more. But once you reach a certain point you’ll get diminishing returns by adding additional bones, so don’t fret about using X amount of bones per gallon of water. It’s better to just start with what you have and adjust from there. Even using 1 or 2 carcasses will produce a stock that is far superior to anything you can buy at the market. I have onions, carrots and celery on hand. That works out well because these three veggies are the traditional mirepoix for stock. 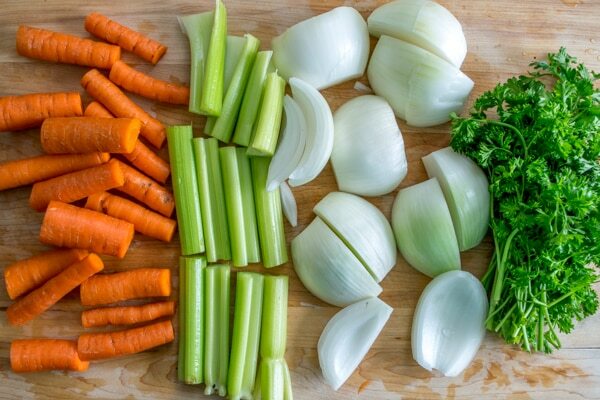 I’ll use 2 onions, 5 carrots, and 3 stalks of celery, all roughly chopped, along with a parsley bunch. I’ll also add some bay leaves and peppercorns. Dump everything in the pot and fill to the brim with cold water. Bring to a boil (it might take awhile) and then reduce heat so that it’s just barely simmering. Along the way, you’ll see some foam rising to the top. These are referred to as the impurities of the stock. Most people remove them, but it doesn’t matter too much in the big picture. 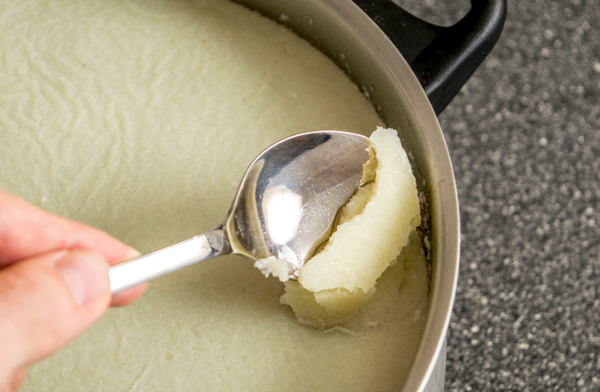 You can use a slotted spoon to skim off the foam, but don’t worry about getting every last bit. Simmering time mostly depends on what else you have planned for the day. 60-90 minutes will produce a fully adequate stock. 2 hours or more will produce a more concentrated stock. Both will work. Strain through a fine mesh strainer into some mixing bowls. You can remove the big chunks with tongs before straining if you want. Let cool on the counter for a bit. See that layer shimmering on the top? That’s the fat. People can’t agree on things like how much fat should be in the diet, so of course you’ll get differing opinions on how much fat should be in your stock. 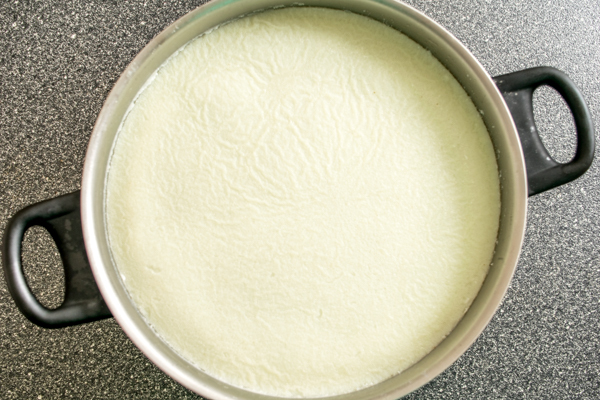 Some or all of this fat can be skimmed off and discarded. Before portioning for storage I usually give it one last strain through a cheesecloth to remove any other bits. And there you have it, a Use What You Have chicken stock. You can keep a few cups in the fridge for use over the next few days. The rest will freeze beautifully and your taste buds won’t know the difference a couple months down the road. It’s a kitchen transformer when used in Mexican soups, sauces, Mexican Rice, Cilantro Lime Rice, etc. Below is the recipe for homemade chicken stock but don't forget that these are just general guidelines, feel free to just use what you have! Roughly chop the veggies into evenly sized chunks. 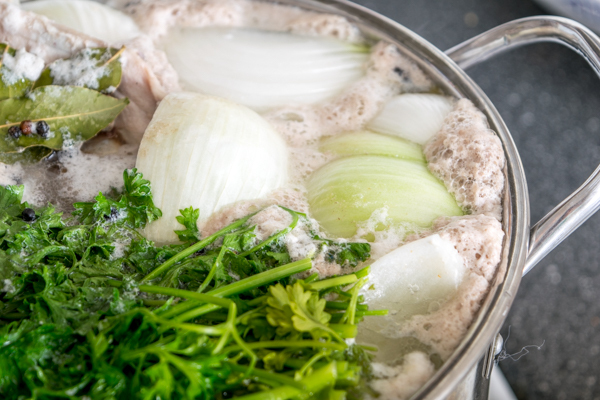 Add chicken carcasses and all of the above ingredients to the stock pot. Fill pot with cold water. Bring to a boil and then reduce heat to a simmer. Let cook for 1-2 hours. Strain off impurities of the stock if you want. 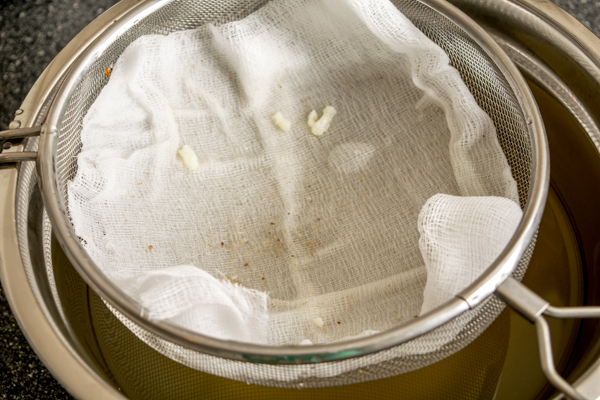 Strain stock through a fine mesh sieve and let cool on counter for a bit before adding it to the fridge. Let the stock cool in fridge overnight. The next day you can strain the fat off and discard. Portion the stock out for the fridge and freezer (you can strain one last time with a cheesecloth if you want). I usually keep a few cups in the fridge and store the rest in the freezer. Simmer time is mostly dependent on your day. A longer simmer time produces a more concentrated stock. 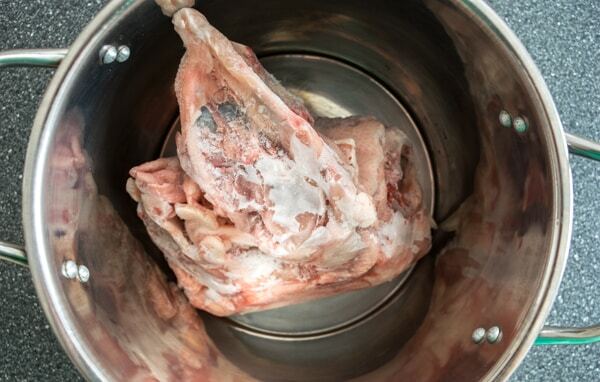 Start keeping your chicken carcasses in a bucket or ziploc in the freezer. You can also keep your vegetable odds and ends to use for stock. 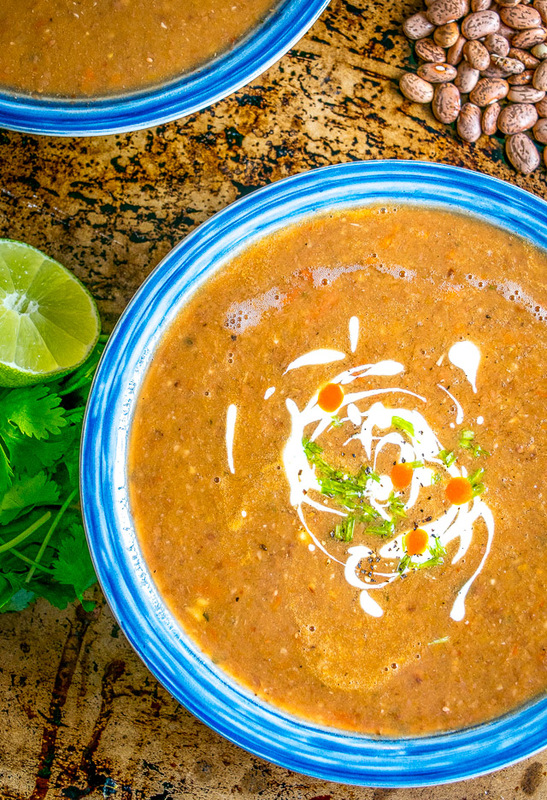 Try this stock in our Pinto Bean Soup. 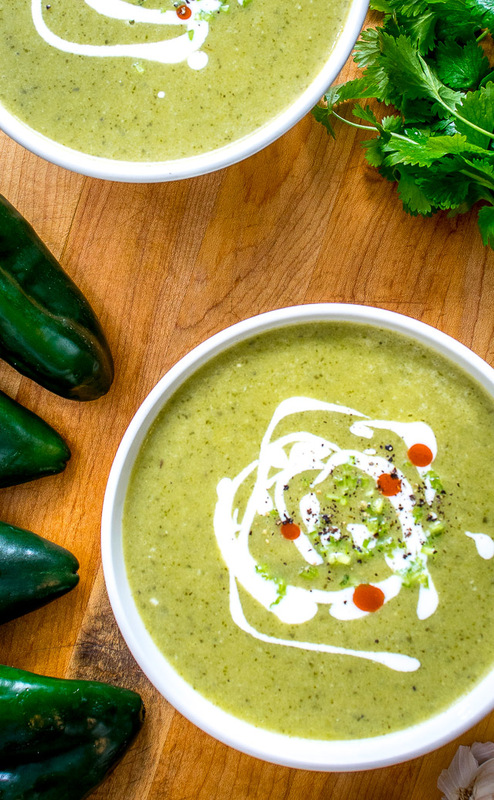 Or in our Roasted Poblano Soup. Hi Patrick. Just found your site today. Love it and my hubby will love it too. He would eat Mexican food daily if I would make it. My question is what substitute would you suggest for the 4 chicken carcasses as I don’t typically them sitting in my freezer. Thanks for your blog! Hey Crystin, thanks for the feedback! If you want to make a big batch I would probably go buy some carcasses. Most local butchers will keep them on hand after trimming the meat off and sell them cheap, anywhere from one to two bucks a pound. Lately I buy bone-in chicken breasts and after trimming the breast off I save the mini-carcass in the freezer until I have enough to make a batch of stock. Hello Patrick! I love your weekly emails, keep ’em coming! I understand using raw chicken carcasses is most beneficial but what are your thoughts on using a carcass from a cooked rotisserie chicken ? Hola Stephanie, thanks for your note! My thoughts on using a rotisserie chicken carcass to make stock are…. Go for it! Sure, maybe you’ll get a more concentrated flavor from a raw carcass that has more meat on it, but using a rotisserie carcass is still going to give you a great batch of stock. I would probably wait until I had a few of them on hand (just throw them in the freezer until you need them) because it’s worth it to make a big batch of stock when you finally dedicate some time to it. I think you’ll be surprised at how much better it will taste than store-bought stock. But keep in mind that nobody can agree on nothing these days and that includes stock making. You’ll get all sorts of opinions on the ‘right’ way to do it but the most important thing is to just do it and that will always be the best recipe. Hope that helps a bit. Good luck! 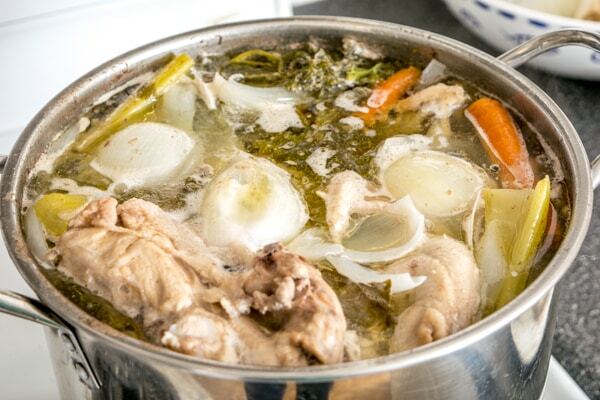 1)For the chicken stock you store in your refrigerator, how long does it last? 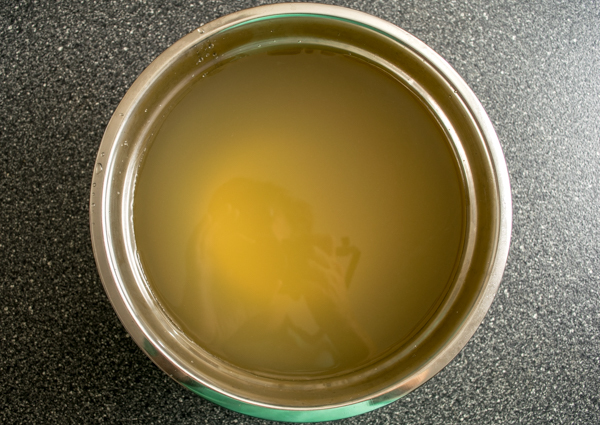 2) For the chicken stock you freeze and store, how do you thaw it when you need it for a recipe? I keep some of the chicken stock in the fridge for a few days, but not much longer. I typically freeze the rest of the batch. To thaw it I let it sit on the counter for a few minutes so that it easily slides out of its tupperware container into a saucepan. 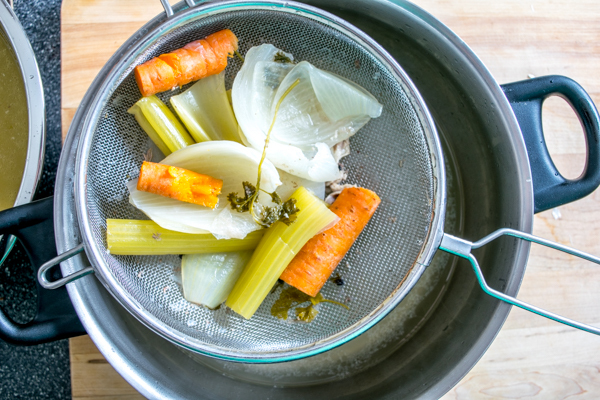 Give it 10-15 minutes on medium-low heat and you’ll soon have a warm batch of fresh stock ready to use. In a pinch you can use a fork to twirl the frozen clump around in the saucepan and this will thaw it out even quicker. Hope that helps a bit, let me know if you have any other questions. Hi! 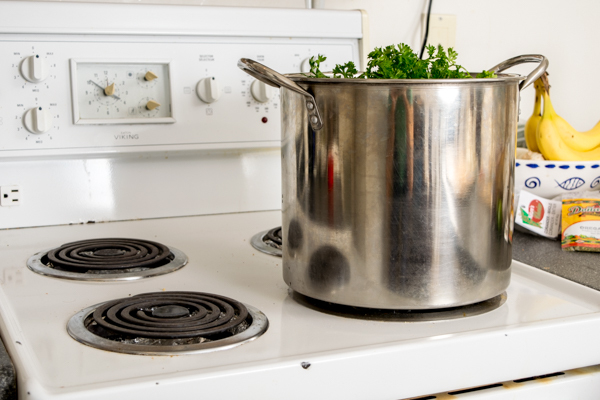 Could you use cilantro for the stock in lieu of parsley? Hey Bunny! Hmmm never tried that one. I think I would just omit the parsley and not worry about a substitute as it’s not a dealbreaker — I would be concerned that the cilantro would dominate too much. You could also consider using a smaller amount. Cheers.